A popular alcoholic grape drink from Dagestan combines the qualities of grappa with a good whisky. There is one particular drink in the Russian vodka family that is not actually a vodka: Kizlyarka. Unlike proper vodkas, which are made of wheat or rye alcohol and artesian or spring water, Kizlyarka is a strong liquor — 45 percent alcoholic content — made of grape pomace. In that sense, it is similar to grappa. The tale of how this southern drink became part of the northern vodka family is quite interesting. Kizlyarka is named for the Dagestani town of Kizlyar, a Caucasian settlement many centuries old. The town was founded at a busy crossing on the Terek River by Persian merchants. In the second half of the 16th century, Russian troops set up an outpost there to guard that important trading route. A hundred years later the town consisted of eight ethnic quarters populated by Russians, Persians, Armenians, Georgians, Christian Caucasians, Akkin Chechens (who served the Russian crown), Tatars, and Circassians. Despite their different ethnic backgrounds, all these people had a lot in common. Most of them were involved in trade or military service, and most of them liked to have a drink or two. The local Muslims, incidentally, were not far behind the Christians in that regard. The people living in what is now Dagestan had a long tradition of winemaking, and their attitudes to the Sharia laws were very relaxed. Winemaking near Kizlyar became a major industry in the 19th century. Conditions in the valley in which the town sits proved ideal for cultivating imported French grapes. The grape pumace left over from wine production was used to make huge amounts of home-brewed alcohol. It was regarded as the family vodka brand of the Tsitsianovs, the local Georgian aristocrats who had bought a license from the Russian government granting them monopoly on spirits production in the region. But the distilleries that are still in operation today were actually founded by David Saradzhev, an ethnic Armenian who had studied chemistry and commerce in Europe. Saradzhev was known all through the south of Russia for his charity work. Kizlyarka is still being made at the distilleries built by Saradzhev. The wines and other spirits produced in and around Kizlyar have enjoyed a well-deserved fame since the early 19th century. Kizlyarka itself was a working-class drink; it was especially popular among the Russian troops who colonized the Caucasus. It is mentioned in many books by various Russian classics, including Leo Tolstoy and Nikolay Leskov. Literary fame is not always a guarantee of good quality, but the makers of Kizlyarka really do have something to be proud of. Compared to other grappa spirits, Kizlyarka has a very mild and balanced taste, with a strong vanilla undertone which it owes to the Caucasian mountain oak. The drink matures in oaken barrels for a period of six months to several years. The Caucasus is something of an exotic greenhouse for Russia; the local subtropical forests and mountain meadows are famed for their biodiversity. There are several oak species growing there; the distilleries mainly use two of them: the rock oak, and the petiolate oak. The oak wood grown near Kizlyar is so good for wine-making that a lot of it is exported to France. The French use it in combination with the Limousin oak, which has long been in short supply. The rock oak that grows in the region is also very similar to the Welsh rock oak, the source of wood used in whisky barrels - and whisky is famous for its vanilla aftertaste, too. For those who appreciate exotic drinks, there is no need to travel to faraway Dagestan to try something that is called vodka, but actually combines the qualities of grappa and single-malt. 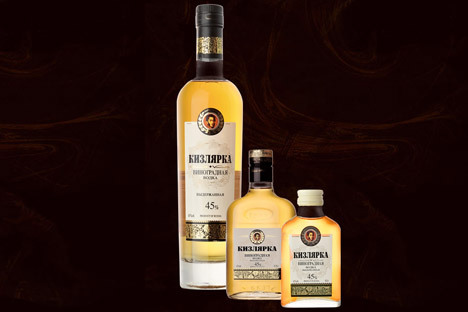 Kizlyarka made by the distillery that was opened by Saradzhev back in 1880 is sold in many Russian cities. It can be easily recognized by its intense golden color and the picture of Duke Peter Bagration on the label. The famous Russian military commander of the Napoleonic wars period also had family ties with Kizlyar.